Prehistory is the large time period of history before humans developed writing or a written history. It is difficult to pinpoint the year when writing officially began, but sometime around 3500 BCE is when the first organized writing system appears (about 5500 years ago). Human prehistory is much larger since we have only been writing for the last 5,500 years. Scientists and historians believe modern humans (that look like us) came from a long line of animals called hominids [HA-min-id] that slowly changed over time. Hominids are the group of primates (apes) that walk on two legs—this includes modern humans (yes, you are a primate). Over the last 3-5 million years, our ancestors gradually changed in size and appearance due to changes in their environment, diet, and lifestyle. These slow changes are called human evolution. The changes were very slow and small, but over 5 million years, small changes added up to major changes in our appearance. Science allows us to find the age of fossils because all living things are made of carbon. We can find the date that carbon began to breakdown. Carbon begins to breakdown when living things die. So, we can find the age of bones, wood, cloth, or other plants if they turn into fossils. Radiocarbon dating allows us to date living things accurately up to about 50,000 years. Other elements beside carbon are used to date fossils up to 2.2 billion years old. The evidence shows modern humans (Homo sapiens) evolved in Africa about 200,000 years ago. About 2.5 million years ago, our ancestors learned to use stone tools—our first real sign of intelligence, compared to other animals. 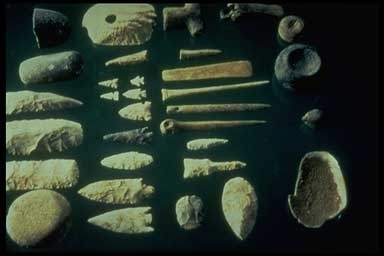 The use of stone tools began what is called the Paleolithic Age [PAY-lee-o-lith-ic] or Stone Age of human history. The Stone Age lasted for most of the last 2.5 million years as you can see below. The Stone Age ended when humans learned to take metal from rock (ore) and make metal tools. This began the Bronze Age. This occurred between 8,000 and 5,000 years ago (between 6000 BCE and 3000 BCE). Our ancestors learned to control fire very early in some areas, but the evidence in most parts of the world shows hominids could control fire about 300,000 years ago. Fire allowed people to cook food, become healthier, and have a longer life. Fire also provided heat, light, and protection at night. Controlling fire was another sign of hominid intelligence. Early humans lived in small tribes of hunter-gatherers. At this point in our history we were nomads. Nomads are people who stay on the move looking for food, without a permanent home. Many nomadic tribes may have moved only during the change of seasons as different foods became available. Finding food dominated this time in our history. Every day was a struggle to find enough food to feed the group. This prevented us from discovering new things, until the time when we didn’t have to worry about finding food each day. Genetic [jen-E-tic] evidence—the DNA in our genes we pass down to our children—shows us clues about human migration. Africa was the only place on earth where modern humans lived until about 100,000 years ago. The last Ice Age began about 100,000 years ago, so we probably left Africa because of changing climate and environment. Some humans left Africa and moved into Southwest Asia (Middle East). Still most humans lived in Africa. Eventually, humans moved into Central Asia about 75,000 years ago and from there some went toward East Asia and others went toward Europe—they arrived about 40,000 years ago. 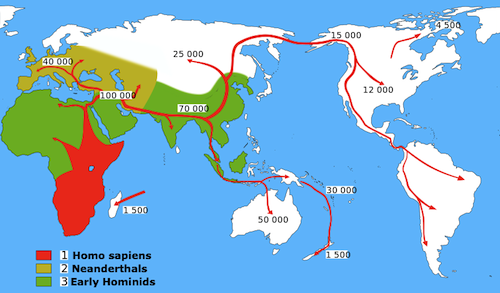 When humans left Africa, there were at least 2 other human-like species they might have seen, shown on the map below. The Americas were the last continents to be reached by humans—groups of people probably followed animal herds from Russia across the land bridge into Alaska. This group much later became Aztec, Inca, Maya, and Native Americans. The water level of the oceans was about 300 feet lower than today—this exposed ocean floor as new land. The water was trapped in massive glaciers that covered North America, Europe, and Asia. This was the last Ice Age. The last Ice Age ended about 10,000 years ago. Our migration is shown by linguistic evidence too. Linguistics is the study of the structure and variety of languages and how they are related. We can trace the movement of people thousands of years ago by studying their genes and the language they speak today. For instance, we know many of the people living in India and Europe once lived in Central Asia together because their spoken languages today have similarities that shows they once had a common language. As humans settled into new environments, they slowly developed unique appearances. Asian, African, and European people look different because they lived in different environments with different amounts of sun, wind, temperature, food, etc. The differences in environment created different adaptations, so the reason many humans look different today is because of at least 50,000 years of adapting to our different environments. Maybe 250,000 generations have passes in the last 50,000 years. Early humans showed another major sign of intelligence about 35,000 years ago. Humans began to draw on the walls of caves—probably other places too, but it has been preserved in caves. Cave paintings often depict hunting scenes. This is some of the first artwork and also an early attempt at written communication. The most important development in human history is the development agriculture, which is another word for farming. Learning to farm meant learning to control wild plants—when they grow, where they grow, and selecting seeds from the best plants to make a better crop next year. This process is called domestication. Domestication means taking something from the wild—plant or animal—and controlling the breeding to create the type of plant or animal that is most desirable for your needs. The ability to control wild plants and animals (food supply) is another sign of intelligence that is uncommon in the animal kingdom. Corn is a good example of domestication. When corn was a wild plant, it was the size of your thumb. Since farmers wanted bigger corn, they saved the largest corn for next year’s seed. This slowly increased the size of corn to today’s huge, delicious pieces of corn. As farming increased, people needed animals to help with the work, so animal domestication began—dogs, sheep, goats, cows, chickens, etc. The same process worked with animals. By controlling the breeding, humans made cows calm and big, dogs loyal hunters, sheep with lots of wool, etc. It is believed that people first began farming around 10,000 BCE (12,000 years ago), although it is different in different regions. Southwest Asia was the first place farming developed—mainly because they had the highest number of plants and animals that could be domesticated. Not every plant and animal can be domesticated. Humans have lived in Africa longer than anywhere else, but many African societies adopted farming much later than other parts of the world. This is due to several factors. Africa had a greater supply of plants and animals that allowed hunting and gathering to be more successful for a longer period of time. Also, they had a much smaller supply of plants and animals that could be domesticated. These factors kept some Africans and other similar people around the world from developing the type of advanced civilizations found in other parts of the world, Ancient Egypt for example. Farming created a lifestyle that forced many changes to nomadic hunter-gatherers. Farming forced nomadic people to live in one place—to take care of and protect their fields. Since farming requires constant attention, farming people couldn’t be nomadic. These new farmers usually settled along a river. Farming also helped to create the first towns. River valleys were perfect for farming, so many people settled in the same area. Water for irrigation was available in the river. Irrigation is another word for watering farm fields or gardens. The soil near rivers is very fertile—or full of plant food and good for growing. The soil is fertile because most rivers regularly flooded during this time. When an area around a river would flood, the water would soak into the ground and a thin layer of silt would be left on the ground. Silt is very small, fertile soil in many rivers (what turns rivers brown). Slowly, more people moved into these river areas. Villages and small towns began to develop. The first cities developed around 9,000 BCE. Farming had other effects on lifestyle and society. In hunter-gatherer tribes, nearly everyone is looking for food or water throughout the whole day. Since one farmer could produce enough food for several people, the other people could experiment and discover new things in the world around them such as natural metals, domesticating animals, medicine, religious beliefs, making pottery, or providing security. Extra food and free time from farming allowed what is called a division of labor. The division of labor is where people do different jobs and create different products and then trade each other their goods or services—like our society today. This change took thousands of years. The society that farming created forced people to interact in new ways. The need for leaders or governments soon developed as people interacted with each other and shared resources. Disagreements over land, water, and trade required some type of government to resolve the conflict. The need for government soon led to the development of laws. The Code of Hammurabi is known as one of the earliest set of written laws. The world was rapidly changing and people finally had time to settle down and think about the world around them. Without science, the world was full of mysteries, and many people asked questions about the world. ‘What is that bright thing in the sky (sun)’? ‘What about those small twinkling things that come out when the bright thing goes away (stars)’? Some people offered answers—this led to the development of religion. Religion is basically a set of beliefs about why and how humans are on Earth and how they should act while here. Below are some early religious symbols. The first religions were often based on natural things such as stars, water, sun, etc. Most early religions were polytheistic or believed in many gods. Most early religions involved sacrifice, usually animals and sometimes humans. Sacrifice wasn’t the only ritual—most religions had special rituals for events such as birth, death, and warfare. Modern religions such as Christianity, Islam, and Hinduism have taken many of their traditions from early religions. Most of the religions that once existed are now thought of as mythology. As people traded and farmed, they needed a way to keep track of when to plant seeds or how much they traded. This need to keep records led to the development of a written language. People have always had a spoken language—even birds have a spoken language. A written language was much more advanced—another sign of our intelligence. As people slowly developed a written language, we move into “history”—prehistory is the history before the written language. Written languages developed very slowly and usually started as drawings. Ideas (such as fear) are hard to draw, so people made symbols to represent them. Eventually people developed a symbol-based writing system. The pictures below show examples of the writing systems that developed in the four early civilizations. Eventually, idea-symbols were replaced with sound symbols, like our alphabet. Even 300 years ago most people in the world still couldn’t read and write. During ancient times more than 90 percent of people couldn’t read or write. A scribe was a special job—someone who could write and keep records of what leaders requested. Humans have been keeping records for only 5,500 years. That is less than 3% of Homo sapiens’ history and about 0.001% of hominid history, so there are still many mysteries to discover. The artifacts and bones left by our ancestors help us understand the hundreds of thousands of years that happened before writing. All of these changes to our way of life, created a new way of life called a civilization. A civilization is an advanced society with farming, division of labor, multiple cities, organized religion, science/technology, some form of government, and a written language. The main factor that allowed civilization to develop was farming. Humans were forced to live in one place and farming also provided enough food to support large numbers of people. Moving from small tribes of hunter-gatherers to an advanced civilization took thousands of years. Most historians think the first civilization started about 3500 BCE between the Tigris and Euphrates Rivers in Iraq, Southwest Asia (Middle East). The land between those rivers is called Mesopotamia. Due to the shape of the land, this area is also called Fertile Crescent or Cradle of Civilization. Different civilizations developed in three other river valleys in different parts of the world around the same time. About 3200 BCE, much of the Nile River came under the control of one king and formed the Ancient Egyptian civilization. Around 3000 BCE a civilization developed along the Indus River in Pakistan/India, South Asia. Finally, Ancient China developed along the Yellow River about 2000 BCE. Many civilizations developed after the first four, but Mesopotamia, Egypt, China, and India were the first four early civilizations.